In this Hanukkah story, Penina fi nds that a glass of cold milk and a hot potato pancake go a long way. Penina Levine is the only member of her family who isn�t looking forward to Hanukkah. Not only is it another chance for her annoying sister to steal the spotlight, but her favorite teacher is taking a mysterious leave of absence, and her best friend is deserting her to go on a dream vacation to Aruba. Then Penina discovers why Mrs. Brown must go away and hears that a snowstorm may ruin Zozo�s trip, and Penina knows she�s the one who must bring some holiday spirit to her friends. 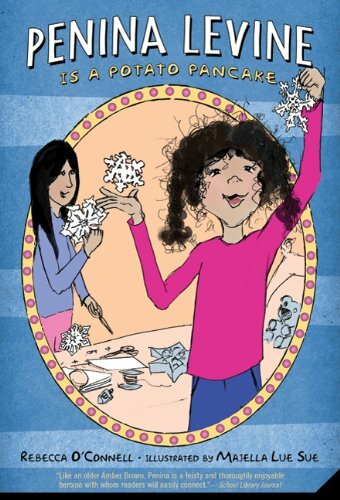 Readers of all backgrounds will relate to Penina as she turns a pile of problems into a Hanukkah to remember. Penina Levine Is a Potato Pancake is a 2009 Bank Street - Best Children's Book of the Year. About Majella Lue Sue (Illustrator) : Majella Lue Sue is a published illustrator of children's books. Published credits of Majella Lue Sue include Penina Levine Is a Potato Pancake and Penina Levine Is a Hard-boiled Egg.